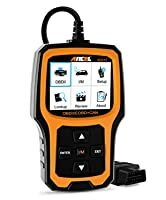 Ancel scanners can help if you are a vehicle owner you can relate to the aggravated feelings of an unknown check-engine light. Bringing your car in for a checkup or a regular repair can be pricier than intended and more often than not, a tedious chore. Fixing it yourself is an option, but in order to do so, you need a clear understanding of the problem at hand. 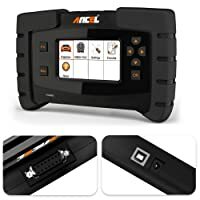 That’s where OBD2 scanners come into the picture, Ancel manufacturers some of the most user-friendly tools on the market. Lucky for you, our team has done the hard part for you and narrowed down the choices to the Top 7 Ancel Scan Tools. 3 Why An Honest Review for the Best Ancel scanners? First, take a look at this comparison chart to decide for yourself which tool looks best to you. 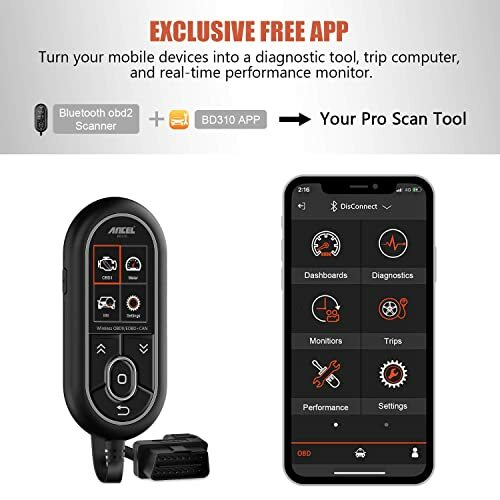 The Ancel BD310 is a 2 in 1 diagnostic device that allows you to see all your vehicles diagnostics on the screen of the scanner or on the screen of your own Android or IOS device. This device is an updated version that is equipped with all 10 test modes for OBD2 scanning. Enjoy handsfree functionality with this Bluetooth 2 in 1 device. Using the free application that comes with the device, you can plug in the Ancel BD310 and with Bluetooth begin running all kinds of tests. You can use an Android or IOS device with a FREE APP to connect Bluetooth OBD2 reader. This device can test trip management, brake performance, acceleration, and battery voltage tests. As well, you can quickly check necessary engine information such as RPM, coolant temperature, oil temperature, fuel consumption, and voltage. 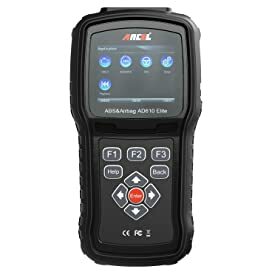 Since the Ancel BD310 works with all 10 test modes for OBD2, you can expect to read and clear engine codes, live data stream, freeze frame data, 02 sensor test, EVAP test, and I/M readiness. This device works on most 1996 and newer US built vehicles. Additionally, for European and Asian made vehicles built after 2001. This device can support hybrid vehicles, 12V gasoline, and some diesel engines, but does not support electric engines. Not all vehicles support the reading of all data. This diagnostic tool is an upgraded version of the previous AD310 classic code scanner. This is a great tool for beginner users or DIY mechanics. 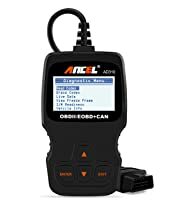 The Ancel AD310 is the classic, user-friendly car scan tool that takes the trouble out of car diagnostics. TWith a large screen, the user can easily read the error codes displayed on the screen as well as retrieve all vehicle information with a click of a button. Plug directly into the OBD2 port on any vehicle and begin pulling engine codes in a matter of minutes. With the Ancel AD310, the user can expect an easy analysis of why the check engine code is illuminated. Additionally, this device can go beyond simple engine codes and also diagnosis undetected issues that may be happening under the hood. I/M readiness, Freeze frame data capture, and live stream data are just a few of the features that are included with the AD310. This diagnostic tool works on most 1996 and newer US bases vehicles. For EU and Asian made vehicles, this device also works with most models that are newer than 2000. Reliable- backed by a 3-year warranty. The Ancel AD310 is a classic scan tool that is built with a beginner user in mind. Although, the reliable functionality and affordability make it a good tool for any user. This particular Ancel scan tool device is built for those vehicles in the Volkswagen Auto Group (VAG). 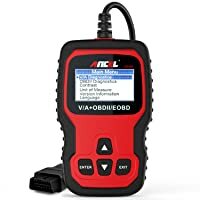 For other OBD2 compliant vehicles, the VD500 will also work as your basic auto scanner, but to really use all the features and functions, if you don’t have a VAG vehicle, this tool might not be for you. For all engine types, the VD500 only allows you to read and clear engine codes, reset the MIL light as well as give VIN number. However, if you are a Volkswagon owner, this tool can do so much more. For those vehicles in the Volkswagen Auto group, the AD500 can help read engine, ABS, transmission, SAS, ESP, TPMS and more. Beyond just reading trouble codes, this tool can support oil reset and EPB service to save time and money for any type of mechanic. The Ancel VD500 is THE recommended tool for anyone who drives a vehicle within the Volkswagon Auto Group. 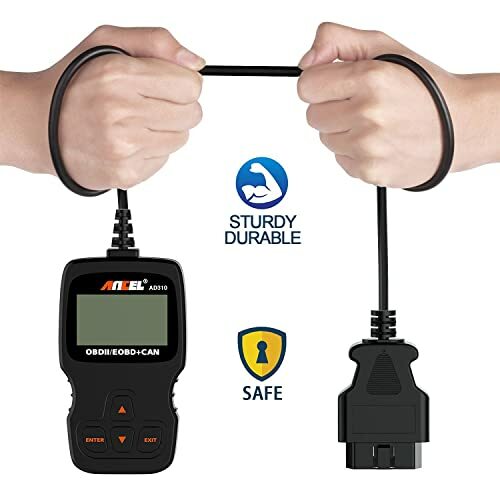 It is also compatible with any OBD2 compliant vehicle older than 1996, but keep in mind it will only function as a simple scan tool for non-VAG vehicles. Simple scanner for non-VAG owners- If your car is not a Volkwagon, this tool might not be right for you. The Ancel VD500 is built for Volkswagen owners and enthusiasts. This tool is perfect for the beginner user, the DIYer or any mechanic who works with VAG specific models. 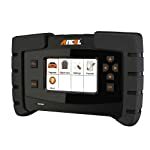 The Ancel AD410 is another reliable, budget-friendly scanner built by Ancel that promises to read and clear engine code instantaneously. You will be able to retrieve diagnostic information from your vehicle and diagnosis the problems with ease. As well, with live data reading, you can view live data straight from your engine which allows you to find the exact cause of the problem. Retrieve codes quickly with a user-friendly interface, you can easily pull codes and start discovering what triggered the check engine light. One positive side to this budget scanner, is the display of the scan codes with a brief description, from there you will have a better idea of what caused the problem. Once the problem has been located and solved, you can use the AD410 to reset the check engine light. Additional functions include I/M Readiness, O2 sensor test, EVAP tests, and DTC lookup and review. AD410 Supports all OBDII protocols. The AD410 supports all OBD2 protocols for any US manufactured vehicle from 1996 to now..
As well this device supports most Ford, Chevy, Mercedes, Suzuki, Land Rover, Nissan, Toyota, Honda, Audi, and more. If your car is equipped with a 16-pin OBD2 port, you should have no problem using this device to pull codes. Fast action scanner- quick processing speeds for speedy results. 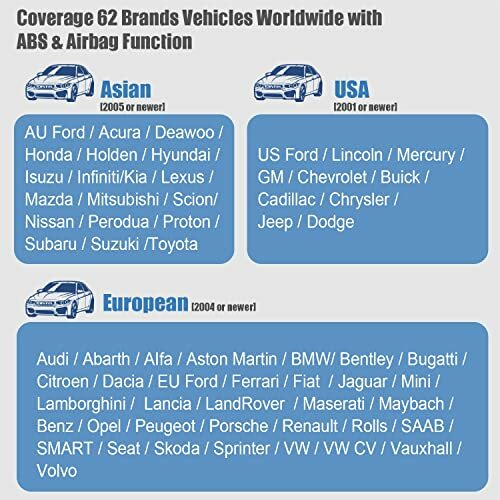 Wide coverage- compatible with various vehicle makes and models. Translate and clear codes- with a brief description, you will have a better idea of what the problem is. The AD410 is a basic, upgraded version of your classic code scanner. This easy to use tool is perfect for any beginner user who wants to clear their check engine light and keep some money in their pocket. 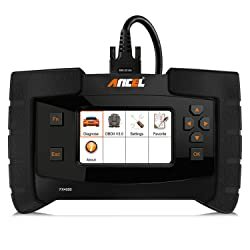 TThe Ancel AD610 Elite is a specifically unique tool because it functions with both OBD1 and OBD2 vehicles. 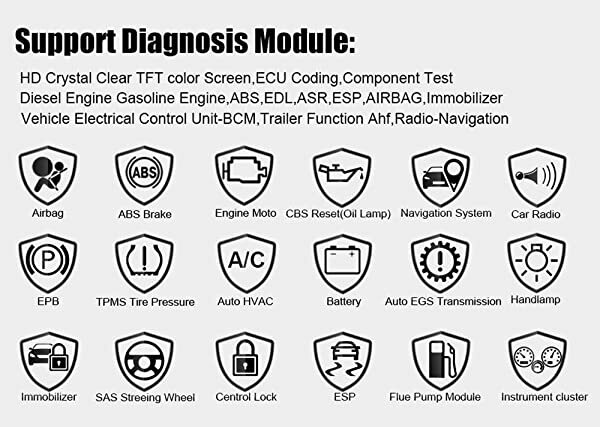 This alone, makes this diagnostic tool the most compatible device on our list, working with over 62 vehicle types. First and foremost, its main duty is to read and clear engine codes that set off the MIL, that includes ABS, SRS and SAS engine codes. Additionally, when preparing for an emission test, you can utilize the AD610 Elite to run I/M readiness tests as well as O2 sensor tests. Easily pull diagnostic information, VIN data and live engine data from your vehicle with this simple-to-use device. Run live data tests and graph all the information to get a clear understanding of the problems under the hood. 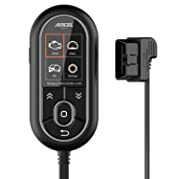 If you own an OBD2 compliant vehicle, the Ancel AD610 Elite will be the perfect pairing for your vehicle’s engine. According to the Ancel team, this device is widely compatible with over 62 car brands. For US manufactured vehicles, this device works with cars 1996 and newer. For other European and Asain made engines, this diagnostic tool should perform with cars from 2001 to 2016. ANCEL AD610 Elite covers 62 brands with ABS and Airbag functions. As with all devices, there are some engines that are not compliant with this tool. It is recommended to check your vehicles compatibility with the Ancel team prior to purchase. Free Upgrades- using the device and SD card, update the software whenever you need. Not an Advanced tool- if you want to do deep diagnosis, a more advanced tool may suit you better. This tool cannot go in depth into the engine diagnosis or offer major support for specific problems, therefore it may not be the tool for an advanced mechanic. However, this tool is feature rich and loaded for those beginner users or DIYers. If you are looking for a step-up from the basic scan tools, Ancel offers the FX6000 as a full system scan tool that has exceptional diagnostic features. Equipped with all 10 OBD2 Test modes and more, there is a reason this device has a slightly higher price tag. The most basic support this device offers is to give clear readings of all DTCs, that also includes ABS, SRS, and transmission codes. Beyond just the basic functions of OBD2 tests, this feature-rich device offers emission testing, SAS, audio monitoring, oil service, TPMS and more. 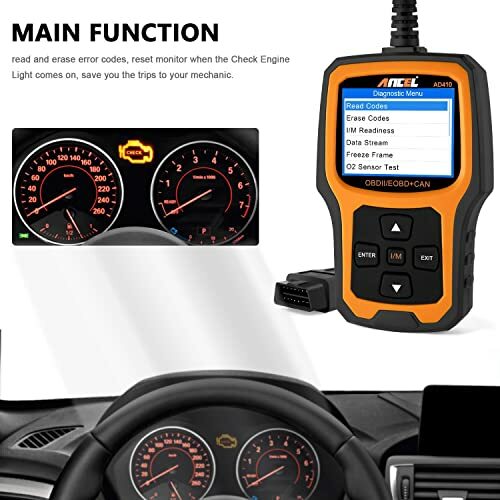 The device itself is built with large, high definition screen loaded with thousands of DTC tips, 11 OBD connectors and 2 years worth of upgrades. ECU programming and coding are two stand-alone reasons that make this tool apart of the elite bunch. With these systems, you can relearn and diagnosis the deeper systems within the engine. Comprehensive OBD2 scanner diagnostics & services to advanced ECU coding and programming. The Ancel FX6000 works well with most 1996 US built vehicles. As well, this device is compliant with European and Asian made vehicles from 1996 to now with OBD2/EOBD CAN systems. The device comes with 11 OBD2 adapters that allow you to work with a multitude of vehicles, for OBD1 vehicles, a separate cord is needed. Additionally, this device has had some issues with vehicle coverage, there are specific vehicles that do not work with the FX6000. Check with Ancel before purchase. Some features are lacking- While it is an advanced tool, not all problems can be diagnosed with this tool. 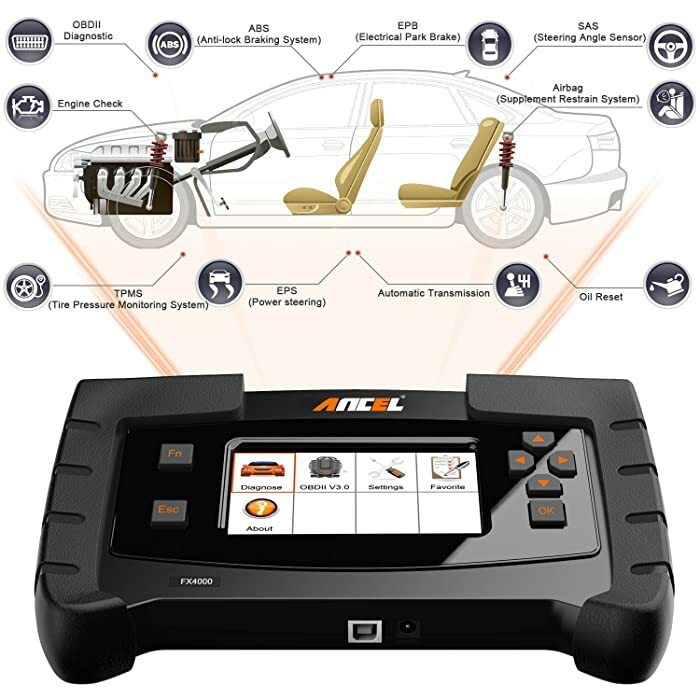 Ancel FX6000 is a great tool for professionals in the automotive field. If you are just getting started as a mechanic, this tool includes an impressive amount of features. That being said, there are still some problems within the FX600 so it might not be the first choice for all mechanics. The Ancel FX4000 has a lower price tag than its sister model the FX6000. This gamer-style design will make the car diagnostics a breeze with a large screen and antislip user-friendly interface with hotkeys. Additionally to the price, the sleek design is also eye-catching. As with (hopefully) all scan tools, your biggest need is reliability for reading and clearing DTCs from the engine. For all main systems, with the FX4000 you will be able to read and clear ABS, SRS, transmission, TPMS and EPB codes. Additionally, this device is more feature-friendly than other basic scanners, and some advanced features allow you to run engine tests. These include EPB service, oil light reset, emission test, O2 sensor test, I/M readiness test, and more. Along with running advanced tests, the FX4000 can also pull vehicle information such as VIN data, live stream data and freeze frame information with the click of a button. FX4000 offers lifetime free updates online to fix the latest bugs or add newer parameters. The FX4000 works with both gas and diesel engines. Additionally, it supports over 40 major US car brands built after 1996, after 2001 for European models, and after 2003 for Asian cars. However, there are always exceptions to scan tool compatibility and it is advised to check your engine compatibility before buying. Mid-range tool- if you’re a professional who needs more advanced coding, this tool is not it. The FX4000 is great for car enthusiasts and engine DIYers who want to utilize all the features within this advanced scan tool. Especially great for those who want to utilize the full system diagnostic functions this scanner offers. Why An Honest Review for the Best Ancel scanners? The OBD2 scanner market has become oversaturated with diagnostic scan tools. It is our hope that with clear and concise reviews about the most important features of Ancel scan tools, you will be able to find the product that is the right match for you. We have narrowed it down to a few short criteria looking at each tools features, compatibility and pros and cons to determine what is the best fit for the user.